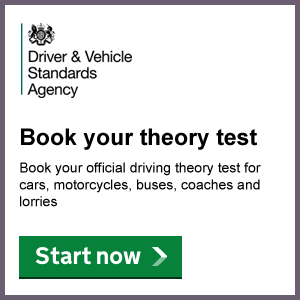 The theory driving test has two parts – The Multiple Choice followed by the Hazard Perception. You have to pass both parts to pass the theory test. Before you start the multiple choice part, you have the option of a 15-minute practice period to get ready for the test. For both parts of the test – you are given a test question to practice with before starting the assessed part of the test. When you start the theory test – you need to answer questions by pressing on a touch sensitive screen- In the hazard perception test – you will click on each clip with the use of a mouse. You will have 50 multiple choice questions to answer – The pass mark is 43 or more. The time allowed to complete this part of the test is 57 minutes. Some questions will require more than one answer – a message will appear if you don’t select enough answers. There are case study questions as well. You will be shown a short ‘story’ and be required to answer five questions about it. You will be able to ‘flag’ questions. If you are unsure about the answers you can return to the questions later on. In the Hazard Perception test – a hazard is something that will cause you, as the driver, to unexpectedly change speed, direction or stop. For this part of the test you will be using a mouse to identify the hazard that will be developing. The questions are made up of 14 one minute long clips – each video will show one developing hazard except one video, which has two developing hazards. You can get a higher mark if you respond to the hazard early in its development. The maximum score for each hazard is 5 marks. If you click the mouse too many times – you will see a warning message and receive zero points for that video. Before you take your Theory Driving Test you will be asked for your provisional driving licence (photo card and counterpart). Good knowledge of theory and hazard perception skills are essential for safe driving, and to pass your theory test. Read and understand the Highway Code, and know your traffic signs. Practise with Theory Test questions CD ROMs to gain knowledge. Practise with a good hazard perception DVD to perfect your skills of spotting developing hazards. Take a practice theory test to check how much you have learnt. The questions are not used in the real test, but they are based on the same topics as the test.